In the fall of 2008, my husband and I took the train from London to Edinburgh on a self guided tour of the city. Our package included tickets to see Edinburgh Castle which is the coolest castle ever. While there I noticed a small building named St Margaret’s Chapel. This aroused my curiosity. Who is St Margaret? There was a small pamphlet for purchase called “St Margaret, Queen of Scotland and Her Chapel” which I bought and read. 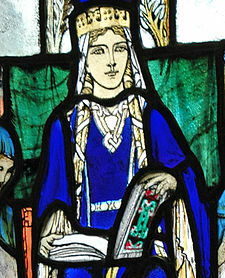 Saint Margaret was Queen of Scotland in the 11th Century. I had never heard of her. When I returned home, I started researching Anglo-Saxon history and discovered that Margaret was related to the Anglo-Saxon Kings. In our prior blog about Emma of Normandy, we learned she married King Aethelred the Unready as his second wife. Aethelred and his first wife, AElfgifu had a son named Edmund Ironside. Edmund in turn had two sons, Edmund and Edward. When Aethelred died, the Danish invader Cnut took the kingdom, killing Edmund Ironside in the process and sending his two young sons into exile to Sweden. From there they went to live with relatives in Kiev. Andrew, the future King of Hungary visited the court in Kiev and met the two young boys. When Edward was in his twenties, he married Agatha, a woman whose ancestry is unknown. When Andrew needed aid in seizing the throne of Hungary, he invited Edmund and Edward to help with promises of riches and property. Edward and his new wife moved to Hungary. It is believed that Margaret was born in Hungary around 1045-1047, the eldest child of Prince Edward. Margaret had a sister Christina and a younger brother Edgar, called Atheling. (Atheling means “king ready”). The Hungarian King fulfilled his promise by giving Edward money and property so Margaret lived in Hungary in relative comfort until 1054. At that time, Edward the Confessor, King of England, who had no heir, summoned Margaret’s father to come, possibly promising him the throne. Shortly upon arrival in England, Margaret’s father died, either of natural causes or murder. We will never know the truth of what happened. Agatha, Margaret and her siblings came under the care of Edward the Confessor’s Queen, Edith of Wessex. Margaret, more than likely was sent to Edith’s favorite convent, Wilton for schooling and religious training in the Benedictine Order. While at Wilton, Margaret became immersed in the cloistered life and began to dream of dedicating her life to God. It was also during this time that Malcolm of Scotland came to the court of King Edward and may have met Margaret. Events in 1066 would change everything for Margaret’s family. When Edward the Confessor died in late 1065, there was a possibility Margaret’s brother Edgar could become king. But the king’s council knew a young boy would not be able to hold on to the kingdom and instead elected the seasoned warrior, Harold of Wessex as King. By the fall of 1066, William the Conqueror had defeated Harold at the Battle of Hastings and had himself crowned King. Margaret’s family was treated fairly well by William but Agatha decided to go into exile in 1068. There are two possibilities for what happened next. Either Agatha intended to sail to Scotland or, she planned to return to the continent and a storm buffeted their ship and forced them to land there. They were heartily welcomed by the Scottish King Malcolm and lived at his court. Margaret and Malcolm were married in 1070. Margaret’s true dream was to become a nun but she probably felt she could serve God with more resources as Queen. Malcolm was forty at the time and this was his second marriage. By all accounts, Margaret was a beautiful, blond Saxon princess in her twenties who was educated and had learned the art of being a royal wife from Edward’s Queen Edith. She immediately began work on improving the Scottish court at Dunfermline and later at Edinburgh Castle by furnishing and cleaning. She dressed her husband in more royal clothes and started an entourage around him to give him a more royal presence and authoritative demeanor. She also began her great works of charity. Most of what we know of Margaret is from a biography commissioned by her daughter Matilda of Scotland and written by Bishop of St. Andrews Turgot, who knew Margaret personally. He describes how Margaret served the poor every day of her life and worked hard to transform the Scottish church. She gave food, money, clothes and gifts to churches and individuals. She loved to meet anchorites and hermits who had dedicated their lives to God. While she had no power as Queen, she did have practical influence on her husband. She was lucky Malcolm loved her so much he allowed her to indulge in these works of generosity. She loved to walk to a small grotto not far from Dunfermline Tower to pray in peace. This cave is still there. Margaret began a building program for Dunfermline Abbey and constructed a ferry so pilgrims could cross the Firth of Forth to travel to the shrine there for free and to St. Andrew’s further to the north. She did all this while having eight children and praying and following religious observances herself for many hours. She followed the rules of fasting and abstemiousness so well, it probably killed her in the end. Over the years, Malcolm allied with Margaret’s brother, Edgar the Atheling in trying to establish him on the throne of England. He also aggravated William the Conqueror and his son William Rufus II over the years by raiding Northumberland five times. The last time he went in 1093, Malcolm and their eldest son Edward were killed in battle. By this time, Margaret was critically ill. When her second son Edmund came home from the battle that killed her husband, he did not want to tell her the bad news. But she already knew her husband and son were dead. She lived for four more days and finally died on November 16th. Margaret was buried at Dunfermline and later, Malcolm was buried with her. Revelations of her saintly life began to circulate. People flocked to her tomb and miracles were perpetuated. A survey of miracles was eventually compiled and sent to the Pope Innocent IV and he canonized her in 1250. Some may find her dogmatic and smug but no one can deny she served the poor and did good works. Three of Margaret’s sons became of Kings of Scotland and her daughter Edith, later named Matilda, married the son of William the Conqueror, Henry I and became Queen of England. It is said the Scottish Church was reformed more under her son David I than under her but this is proof her legacy lived on through her children. 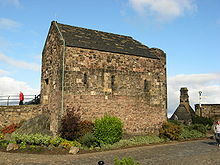 He is the one who built the small chapel in Edinburgh Castle in honor of his mother. Thank you for your information Jan. It seems Agatha’s ancestry is a medieval mystery. I have corrected the post. Queen Margaret was my 19th GGrandmother. She sounded like an awesome woman. She really left a legacy of doing good in this life. It was too bad that she was treated so poorly after her death. Julie, how were you able to trace your lineage that far back? I have my family tree and it goes to around the 1500’s then stops. But then as an aside, my gg grandmother says we were descended from Charlemagne. Do you have any resources or advice on where to start? Thank you in advance! Nigel Tranter also wrote a biography, which is how I first “discovered” her. There is a fantastic historical ficion book by Susan Fraser King about Margaret called Queen Hereafter that tells some of her story.